The Carolina Hurricanes traded for Micheal Ferland in the offseason. Along with Dougie Hamilton and Adam Fox, Ferland came from the Calgary Flames virtually unknown to Hurricanes fans. The spotlight of the trade was on Hamilton as he was the more familiar name. 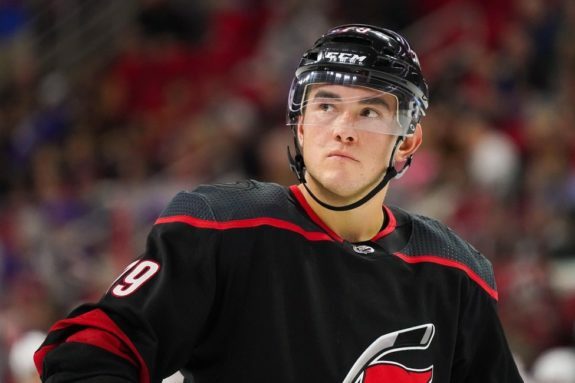 Ferland has played his way into the spotlight, however, and the Hurricanes would be well-served to make sure he sticks around beyond this season. Kent Wilson wrote an excellent piece about Ferland in The Athletic last June. Wilson summarized, “Ferland is very close to becoming the power forward and functionally tough sniper that every GM and coach in the league covets. He has the size, aggression, and raw talent to be a high impact, top-six contributor. However, his game still has some rough edges and there are times when he forgets how to be either an offensive weapon or an intimidating physical presence. If he can figure out how to be at least one of those things consistently (let alone both), he’ll be a Flame for a long time.” (From Season review: “Micheal Ferland takes a step forward” – Kent Wilson – The Athletic, June 11, 2018). Ferland was not a Flame for very long, but Wilson had no way of knowing about the big trade that was unfolding behind the scenes. I’d like to think, however, that one can insert “Hurricane” for “Flame” in Wilson’s analysis and come up with present-day reality. In other words, here’s hoping Ferland is a Hurricane for a very long time. Lo and behold Ferland has lived up to and exceeded expectations. Frankly, all eyes were on Dougie Hamilton as the focal point of the trade with the Flames, but Ferland has stolen the show. With 13 goals, Ferland is second in goals to Sebastian Aho’s 18. More importantly, Ferland has often scored at times when the ‘Canes really needed a goal. He has become a vital part of the team, and signing him should be a priority for the Hurricanes. Ferland has hit all the marks for the Hurricanes. He will be an unrestricted free agent after this season, and that means that management needs to decide if they want to do whatever is necessary to keep him as part of the team. On the surface, the answer would be a resounding “Yes!” Keeping Ferland should not even be up for discussion. Let’s do the deal and make sure he is in a Hurricanes sweater for a long time. That is a fair assessment of the situation. The Hurricanes need Ferland and, therefore, should work hard to sign him. His current salary is $1,750,000, which ain’t chicken feed. How much is it worth to have what LeBlanc likened unto Tuomo Ruutu or even Eric Cole? Those are big shoes, and it may take a big number on a contract to get Ferland to try to fill them. But, even so, not signing Ferland should not even be in the discussion, in my opinion. Elliotte Friedman’s latest 31 Thoughts at Sportsnet has the following: “Carolina is not in a position to allow its potential unrestricted free agents to walk for nothing. They are far, far apart in negotiations with Micheal Ferland, so it looks like “when” not “if” for him.” Friedman is thought of as being in the know on these types of issues, and if he is correct, Hurricanes fans should be very unhappy. Ferland was not brought in as a rental. At least nobody thought that he was when the trade was made in June. Hurricanes general manager Don Waddell has said often that they want to do deals that make sense for the team. Keeping Ferland makes sense. Unless of course, the team wants him blowing it up for another team, a la Jeff Skinner, who scored his 30th goal of the season Friday night against his former team, the Hurricanes. Let’s hope that whatever gulf is between Ferland and the Hurricanes can be bridged. He’s young, competitive and can score, which is something this team needs.